The Virginia Slims are promotional cards for Virginia Slims cigarettes, marketing it's then-new catchphrase "You've come a long way, baby". Produced by tobacco company Philip Morris, they have a very thin stock and a smooth type finish. The faces feature Victorian trimming around the indices, and the pips are custom designed. 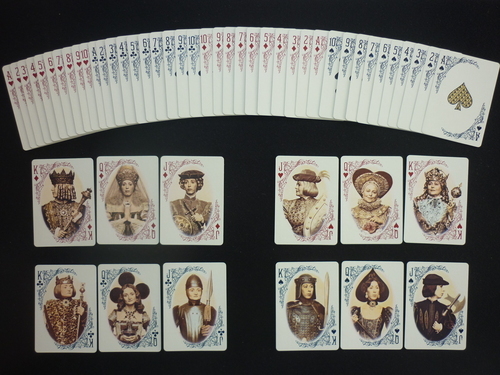 The court cards feature vintage-styled portraits of women in medieval outfits. 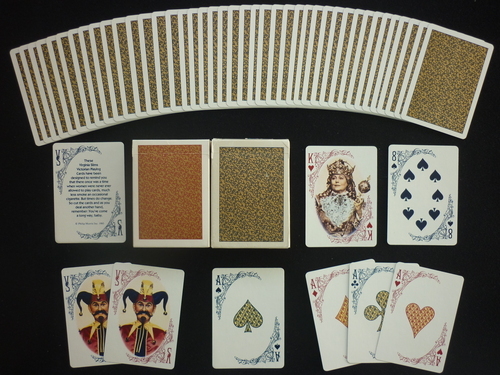 The Joker, the only male in the deck, is portrayed like a court jester. The backs feature a repetition of the catchphrase diagonally in red letters on gold background or gold letters on red background. The aces are all bigger and yellow with red or blue "VS" designs, depending on the suit. "These Virginia Slims Victorian Playing Cards have been designed to remind you that there once was a time when women were never ever allowed to play cards, much less smoke an occasional cigarette. But times do change. So cut the cards and as you deal another hand, remember: You've come a long way, baby." Copyright Phillip Morris, 1985.